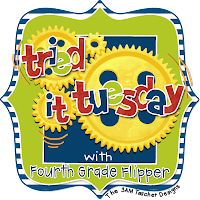 Today I'm linking up with my bud, Holly, from Fourth Grade Flipper, to share an idea that my students ATE UP! My students do not love writing. I've shared HERE how I got them engaged with writing personal narratives, but I was on the lookout for something else that would stretch their imaginations and build both their stamina and confidence as writers. Thus..."Story Starters" was born! 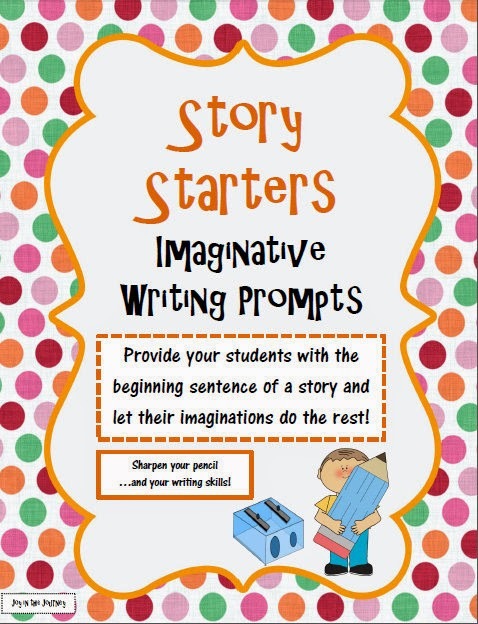 "Story Starters" Imaginative Writing Prompts are 24 writing task cards that provide students with the beginning sentence of a story and let their imaginations do the rest! I printed the cards (in B&W on festive green paper to save ink!) and then put them in an envelope. The students came up, drew a card and grabbed a brainstorming sheet. When we were all done, I called the students up to the front to share their stories - I think it is so important to give kids the opportunity to publish and share their writing. It gives them an audience, a sense of purpose when writing, and it also helps the students develop both public speaking skills and audience member respect. Sometimes I have them just read it to a small group, for time's sake. My students LOVED this activity - most of them begged me to let them draw again and write another story. You can snag this fun, engaging, hassle-free, print-and-go center or whole class activity for only $2! I'd love to give away TWO free copies to my loyal blog readers. If you'd like a chance to win this packet, please leave a comment with your name, e-mail address, and one of your favorite journal/writing prompts to use with students. I'll choose TWO winners tomorrow night at 8pm PST. Wordless Wednesday: New Hair Cut! Wordless Wednesday: Week Before Spring Break. Fuel Your Faith: What is sin?